Celebrating over 25 years of providing exceptional service to the community, Perspective Eyecare prides itself on high quality eye care in a relaxed but professional environment. Dr. Kennedy is committed to staying up-to-date with the latest advancements in optometry as well as providing the best care for his patients. Whether you are looking into contact lenses or the latest in frame and lens styles, the staff at Perspective can help you find what you need for your eyes. We are affiliated with Specialty Eye Institute for laser vision correction and can provide referrals for cataract surgery or any other issues requiring a specialist. Something in your eye or afraid you have pink eye? We can help with that, too! 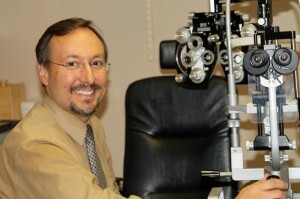 Dr. Kennedy is a graduate of Michigan College of Optometry at Ferris State University and has been a practicing optometrist for over 20 years. He prides himself in very thorough eye examinations, the fitting of all types of contact lenses, pre- and post-operative Lasik and Cataract surgery care, as well as diagnosis and treatment of common eye ailments and infections. Dr. Kennedy is very devoted and truly enjoys every patient interaction. You may go into his exam room a stranger, but you’ll come out a friend! You won’t be disappointed by our opticians! Not only do they have a combined 30+ years of experience, they love what they do! All of our opticians have fantastic taste and are happy to help find the best eyewear just for you. They are extremely knowledgeable, friendly and are up-to-date on all of the latest products and styles available. When you come into our office, you can be assured that we are here for YOU! Whether you need a thorough eye examination, are wanting to get into contact lenses, need to pick out new glasses or want information on Laser Vision Correction, we will provide you with professional and friendly service that you can brag about to your family and friends! We pride ourselves on our exceptional customer service and extensive knowledge and abilities. The office of Robert Kennedy, OD is an independent provider of professional eye care services and products to correct and promote optimal visual function. Our mission is to serve patients’ visual needs in a manner that is convenient for patients, as well as pleasant and reassuring to them. Our location, hours, products, staffing and staff schedule have been specifically designed to create a positive and effective environment in order to achieve our mission and to ensure future practice growth.